Examining every aspect of the culture from antiquity to the founding of Constantinople in the early Byzantine era, this thoroughly cross-referenced and fully indexed work is written by an international group of scholars. 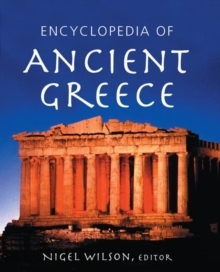 This Encyclopedia is derived from the more broadly focused Encyclopedia of Greece and the Hellenic Tradition, the highly praised two-volume work. Newly edited by Nigel Wilson, this single-volume reference provides a comprehensive and authoritative guide to the political, cultural, and social life of the people and to the places, ideas, periods, and events that defined ancient Greece.